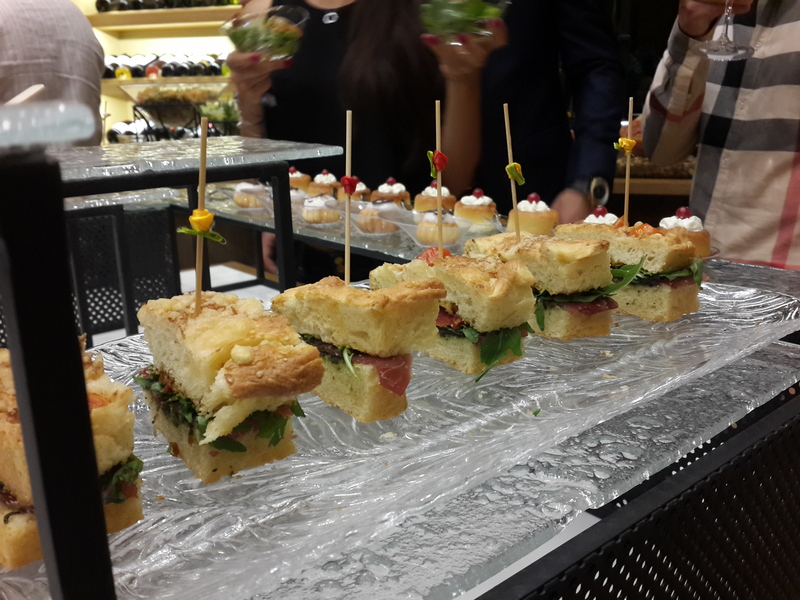 Restaurants – When In Beirut! Back in the ninety-something, on a beautiful Autumn morning, a little food lover was born. This year, I was super duper excited to celebrate my birthday, and so I was determined to find the perfect restaurant. After a long search, I found a little gem that combined my passion for fine cuisine, Art and beautiful bourgeois architecture. This place is called Mezzo Art Lounge. On Tuesday, October 13th, I had the pleasure to attend the opening of Salon de Thé et Restaurant LaDurée at Villa Zein, Beirut Central District. LaDurée is my favourite place to indulge at when I’m in the mood for fancy and luxurious desserts, and their new Salon de Thé is just perfect for my obsession with afternoon Coffee breaks and sweets! It has this beautiful Parisian ambiance for a quick little escape. On Wednesday October 9, I had the pleasure to attend an exquisite foodies get-together, organized by Zomato Lebanon and held at the Hangout Beirut. We were first greeted by the owner, Mr Salim Heleiwa who gave us a tour of the restaurant, which was a 19th century house, and explained to us its history, not forgetting a single detail! Mr Heleiwa is passionate about wine and fine cuisine, and this passion was perfectly translated with the dinner later on. The Sunset Canapé at éCafé with the serVme Team! Rue Sursock is one of my favourite areas around Ashrafiye. 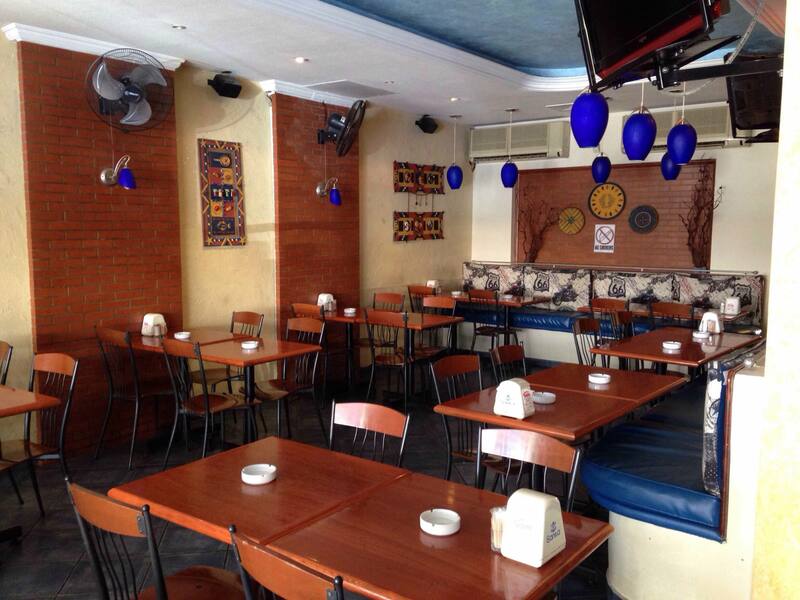 It is a calm street in the middle of a busy Beirut, hiding a lot of history and a little gem called éCafé! I had the pleasure to attend a gathering organized by the serVme team, the “Sunset Canapé”, and savour many little creations. Olac is a restaurant located in Zaarour with a view over a big lake. They serve French and Italian fine cuisine. The interior is very cosy, similar to a hunter’s mountain cabana with a fireplace, wooden décor, leather couches and earthy colours everywhere. Most of us have tried Tonino at least once. They’re known for their great pizzas and crepes. Tonino used to be my favourite place when I was a teenager (It was the ultimate place for date night when you’re 15). Last time I’ve been there was around 3 years ago and I remember how much I loved their pizzas. 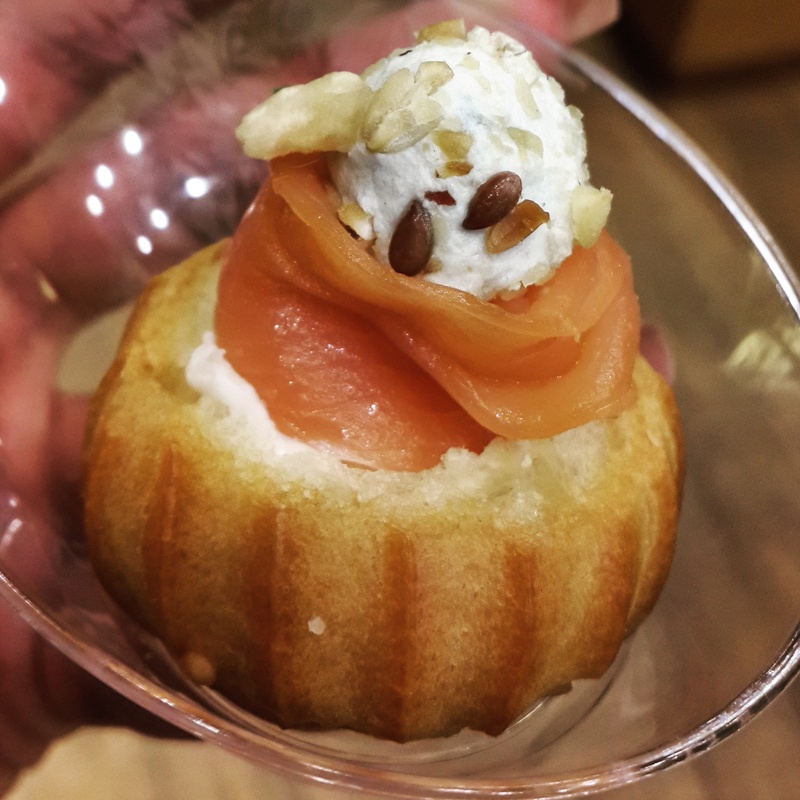 I had the honour to meet award winning Chef, Maroun Chedid, at Le Bar de Taillevent during an exclusive event to launch a very special Aperitivo where all the guests savoured an exclusive gourmet buffet, accompanied with good wine and Prosecco. The evening started around 7:30 PM and lasted till 11 PM. 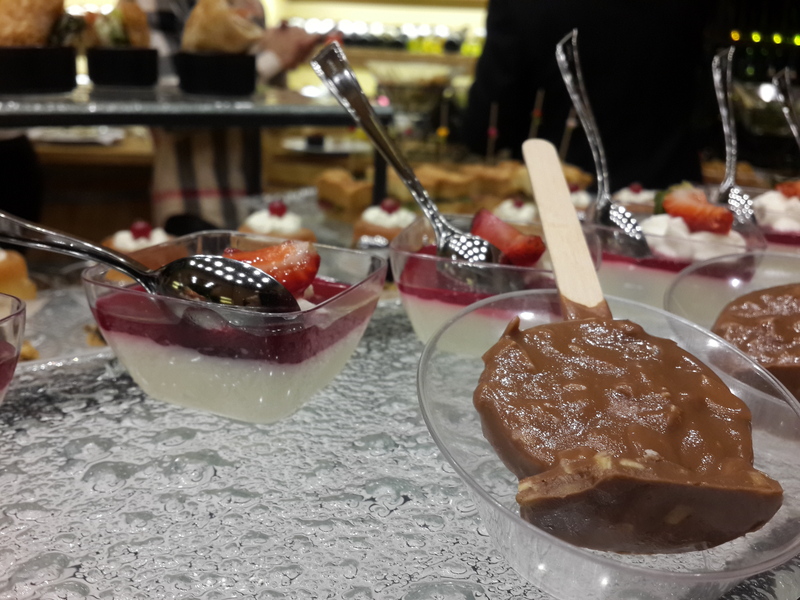 I personally couldn’t stay away from the buffet, especially the desserts! Here are some glances from last night. My weakness, Salmon cakes (in profiteroles). Such creativity! Spanish dried Pork meat. A MUST try! Aperitivos are now served every Thursday as of 7 PM at Le Bar de Taillevent where you can enjoy a glass of wine or Prosecco with a complimentary aperitivo buffet selection. 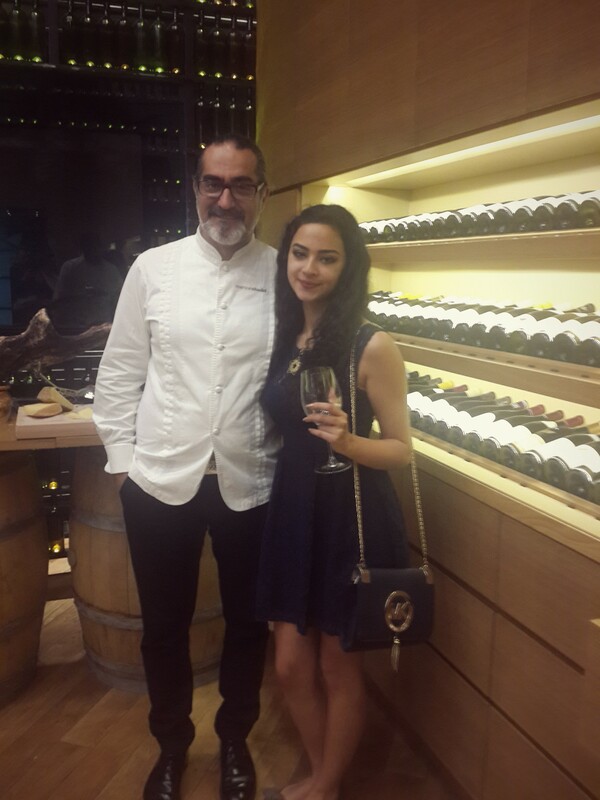 The Beirut Cellar has captured my heart when I first went there for dinner. You can find the review in this post. I decided to go back for a quick lunch meeting. Grilled Chicken: with lemon. 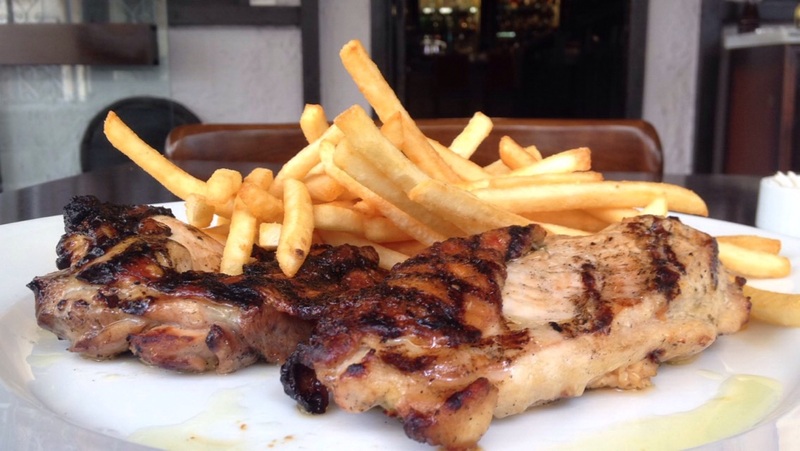 The chicken is perfectly grilled, tender and does not dry out even at the end as it gets colder. The lemon dressing goes great with it. The portion is more than big. 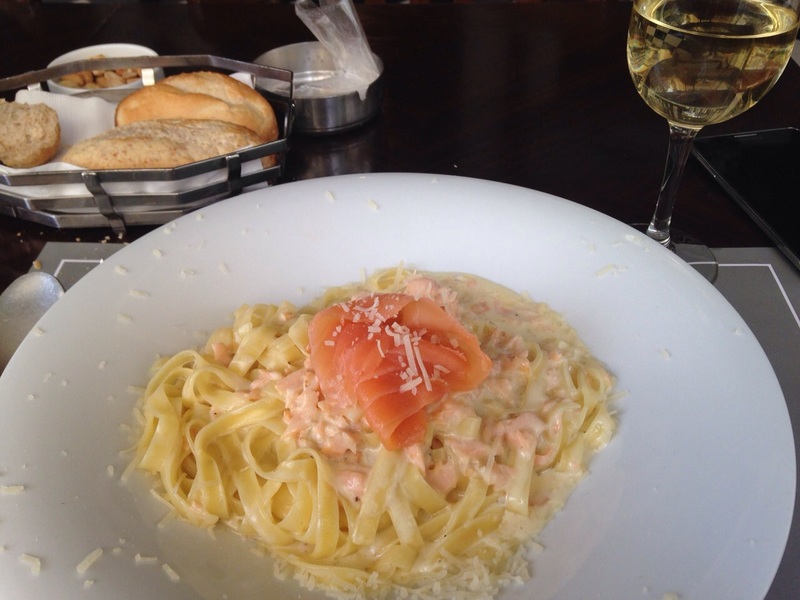 Fettuccine Salmon: This is Beirut Cellar’s home-made pasta. A very generous portion with an amazing taste. Perfect amount of sauce Blanche, leaves you satiated and is kind on the stomach. Bravo! This place has definitely become on the top of my list! 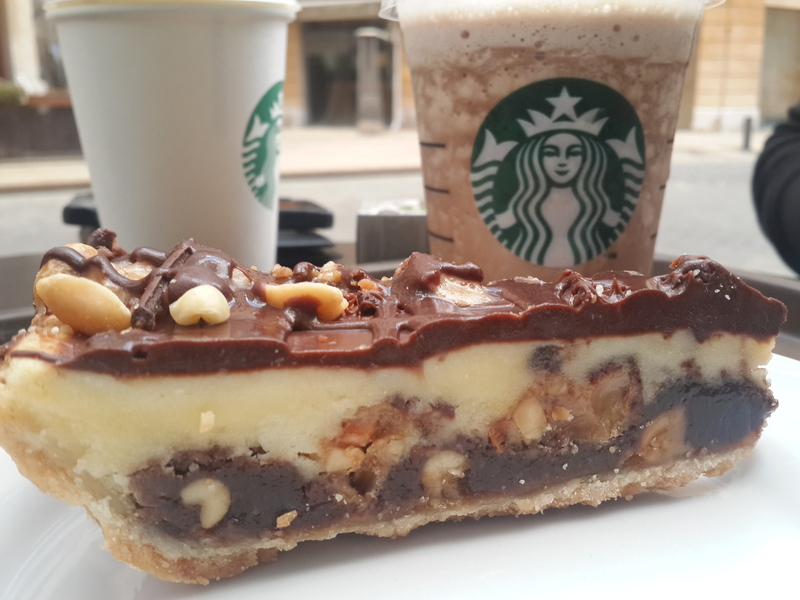 Starbucks had always been one of my favourite coffee shops for their high quality beverages and delicious desserts. 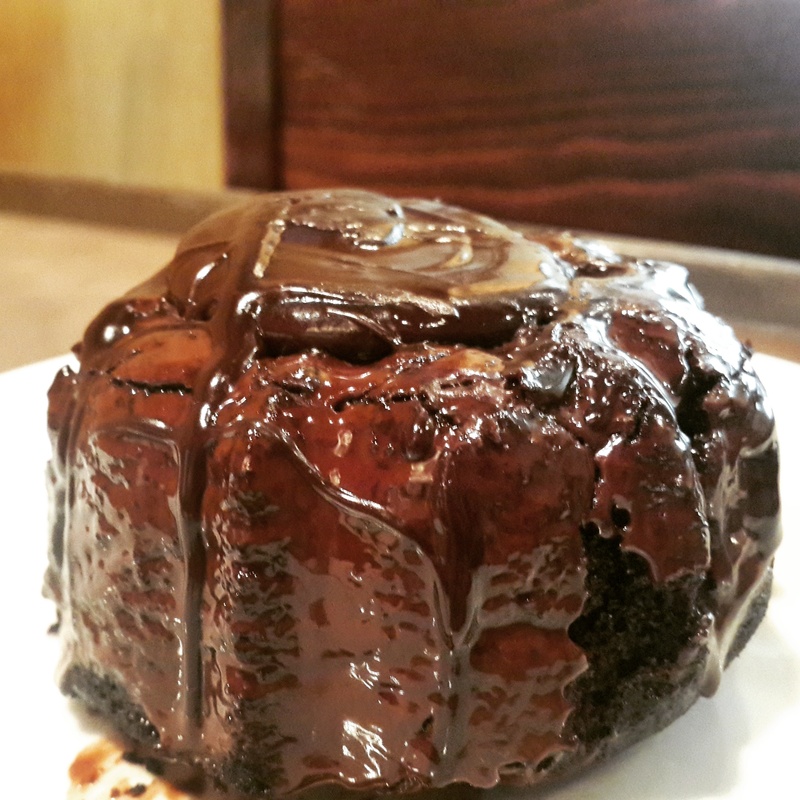 The company has recently introduced a new collection of desserts here in Lebanon and they’re just amazing! Starbucks needed that kind of change. The Snickers cake: I would say it’s more of a Snickers “inspired” but the taste is close enough to the bar and just as good! Chocolate Peanut Butter Stack: Although I’m a big fan of chocolate/PB combination, this one did not leave the impression I thought it would. It’s good but not great. 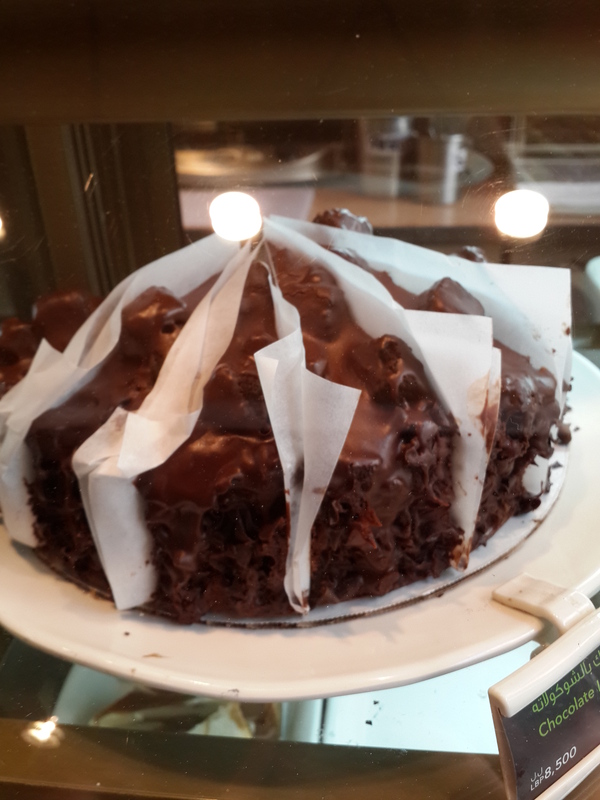 Chocolate Cake: This is the traditional chocolate cake. It’s delicious and satisfying. Carrot Cake is also available but I didn’t get the chance to taste is yet. Blueberry Cheesecake: As long as it’s still very fresh, this dessert is nothing but delicious! There is also a Chocolate Cheesecake version that I still haven’t tasted.